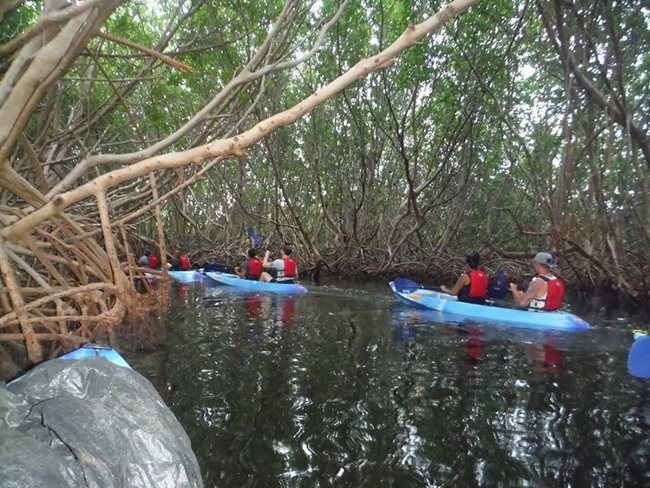 On my recent trip to Puerto Rico, I kept coming across Bespoke Lifestyle Management, which seems the widest ranging tour provider on the island, offering nearing 20 tours that covered everything you could possibly want to do, from kayaking to caving to hiking the rainforest to horse riding, or just taking a tour of the old city of San Juan. 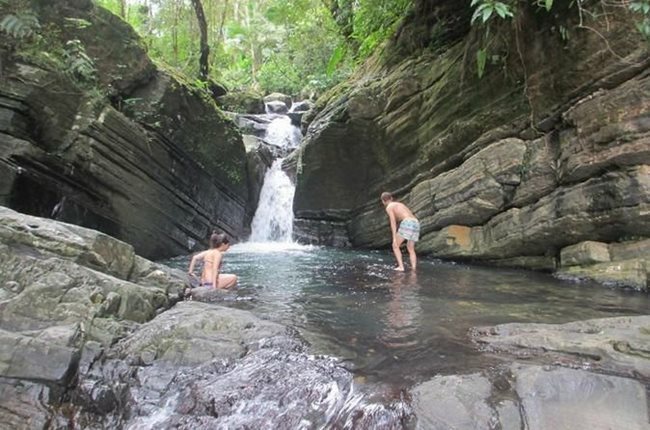 One day I joined their El Yunque Rainforest and BioBay Combo Tour. The two tours are unrelated, although they take place in the same Northeast area of Puerto Rico. Our guide for the day was Hector, who picked up us and others from metro San Juan for the drive to El Yunque, the only rainforest in the United States. Hector was wonderfully knowledgeable and friendly, speaking non-stop for the first hour. He’s proud of the history of the island and eager to share it, with energy that was infectious, although that taking occasional pauses would allow us to time to catch up and process what he was saying and encourage those who felt too shy to interrupt him with questions. 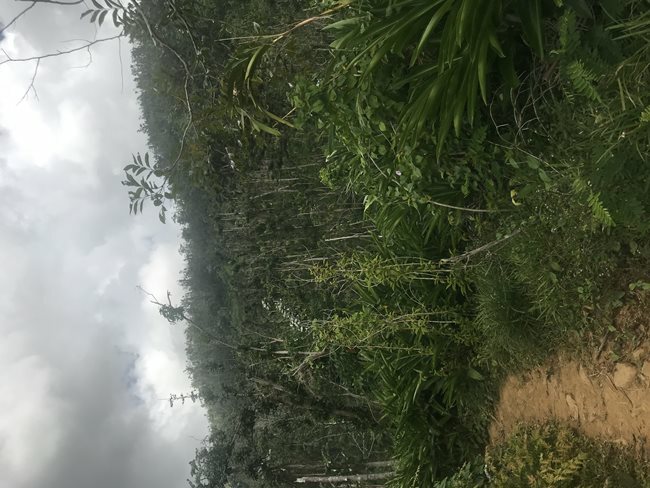 Because of the recent hurricane, which caused many landslides, only a fraction of the rainforest trails were open (I heard 5%), something that surely will improve over time. So instead of spending hours going deep into nature, we took a 15-minute hike to a secluded watering hole. The trail is wide and cleared, so there’s no need for long pants to protect against thorns. Wear swim trunks and bring a change of clothing in case it rains. Hector was remarkably well-informed on foliage and his own fascination with the rainforest led to our own. He showed us the touch-me-not plant, mimosa pudica, which shrinks away when touched, and was planted by ancient peoples as a “security alarm” for intruders coming through. We saw the plants with giant leaves that Robin Williams wore as a hat in Jumanji, which are green on top and white underneath, so that looking out at the mountains, you can see where a heavy wind has come through, flipping them over. We saw the beautiful bird of paradise flower, and so much more. Guests on the trip were a variety of families and younger couples, but it wasn’t a college party experience. Instead, the swimming hole was peaceful. We could relax and bond with nature, or climb up to a high rock with a rope to swing out and jump into the pool. 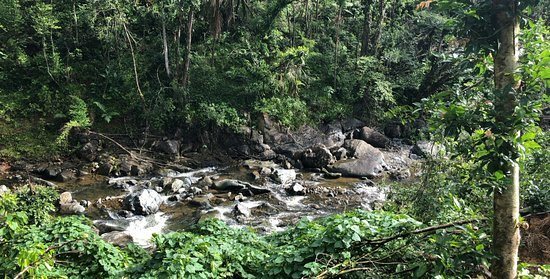 Some from our group broke off to hike deeper into the rainforest to a “water slide”, a volcanic rock hill with water coming down it where you can slide into the water. It was delightful, but not a half-day experience. Around 2:30pm, we had to decide whether to go directly to dinner or to a second location in the forest. Somehow too much time had passed and the guides did not take us there. Instead they served snacks including pineapple and star fruit. There was a lot of waiting. While you expect to wait when you’re with a larger group, some 30 people in three vans, there was a lot of waiting. The guides could have filled in the time with stories, crafts activities, or anything else. Still, it was a beautiful walk, and as we learned, the guide really makes the experience. We learned a lot from Hector, who put us at ease. Despite my wishing for more, it was absolutely a 5-star experience. I can only imagine what an extended or fleshed out tour would be like! So, 5 stars. The Biobay experience, at least at time of year we went in March, was less interesting. Hector drove us to a launch, a beach area where kayaks set out, called Laguna Grande. On the way, hungry and after all the waiting, no one was much in a mood for conversation. Arriving, members of our group had dinner separately at the restaurants there, and Hector passed us to Glass Bottom Kayak Tours, which took the tour from there. After some more waiting for the sun to set, we got fitted with life jackets, got into kayaks, and received instruction from the Glass Bottom guides. Our kayak did not actually have a glass bottom, but this was unnecessary to the experience. The entire trip was some 90 minutes, most of it paddling a mile through a waterway with trees on either side. On the trip out, with the setting sun, this was an interesting challenge, but the channel was difficult to navigate, and this struggle conflicted with simply enjoying nature. The guides identified the tourists having the most difficulty and helpfully towed their kayaks behind their own. Because we went through the channel in a long single-file line of kayaks, we couldn’t hear the guides, who didn’t attempt to explain anything or point out landmarks. They were too busy I think just shepherding tourists along. Then we arrived in open water just as the last rays of the sun disappeared. At night the stars are beautiful, and you can swirl your hand in the water to churn up the bioluminescent microbes, which sparkle. At the time of year we went, in March, there wasn’t much to see. It was interesting in a cerebral way, but not thrilling in an emotional way. Summer is the peak, we learned. We could have sat in our kayak admiring the stars for a long time, but within 10 minutes, the guides were taking us back. Our kayak was way at the front, so the late arrivals behind us probably had even less time. The paddle back was challenging at night, with zero visibility except the glow sticks on the kayaks ahead of you. If you were in the middle of the long line of kayaking tourists, you were far from the guides, left to yourself. Guides didn’t get to know us or play a role educating us. It was too bad that Hector didn’t come along. The night stars were beautiful, but we didn’t learn anything, and there was so much traveling, paddling, and waiting for tourists to change clothing, get together, and go. So much waiting. I have to believe that during the peak summer months that this is a transformative experience, but for us in March, it was only a 3-star experience, not worth the time. 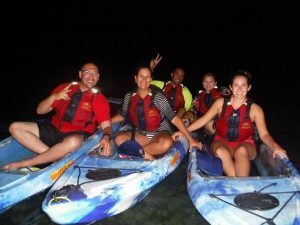 Bespoke has many other tours and can take you on the El Yunque tour separately, which is my recommendation in the bioluminescent off-season. So, 5 stars and 3 stars, respectively.